Have your prescriptions filled immediately. If you have been given an antibiotic, finish the entire amount. With pain medications – do not drink alcohol. Keep your bandage(s) clean and dry for the first day (24 hours). Do not attempt to “inspect” the wound. Stay off your foot for the first day (24 hours). Elevate your foot/feet on two (2) pillows – above your body. Place an ice bag or ice wrapped in plastic in a towel, on the ankle or behind the bandage for the first 1/2 hour of every hour for the first day. AFTER 24 HOURS: Remove the entire bandage (unless instructed otherwise). Clean the wound by washing it with salt water or an antibacterial soap (Dial, Safeguard, Phisohex). Soak the foot or feet in a quart of warm water mixed with two (2) tablespoonfuls of Epsom salts. Soak 10-15 minutes twice a day. 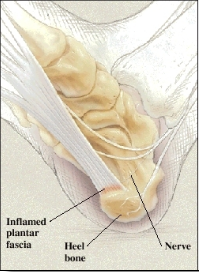 After soaking, pat dry with clean tissue or sterile gauze pad. Place a thin layer of antibiotic ointment (Betadine, Povidone Iodine, Bacitracin) on the wound and cover with sterile band-aid or gauze and paper tape. The bandages become soaked with blood. The medication you have been given does not control the pain. You bump, fall or injure your foot. You see pus in the wound or red streaks on your foot, ankle or leg. You have severe nausea, vomiting or uncontrolled diarrhea.